How long will my AP430SS filter last before I need to replace it? This same information applies to many of the filters we carry, however, the life expectancy of the AP430SS filter (AP431) depends on the hardness of the water, and also the water usage. The harder the incoming water is, the faster the phosphates inside the filter will dissolve. The more people in the home, the more water that will be used. So a family of 6 will use up the filter faster than a family of 3, when the water hardness is the same. To answer the original question, the filters have phosphate pellets inside of them, and if you shake the filter you can hear them rattle inside. Once the filter gets to be about 1/4 - 1/8 full (nearly empty), you should replace the filter. Anything less than that and the filter won't have enough phosphate to treat the water properly. 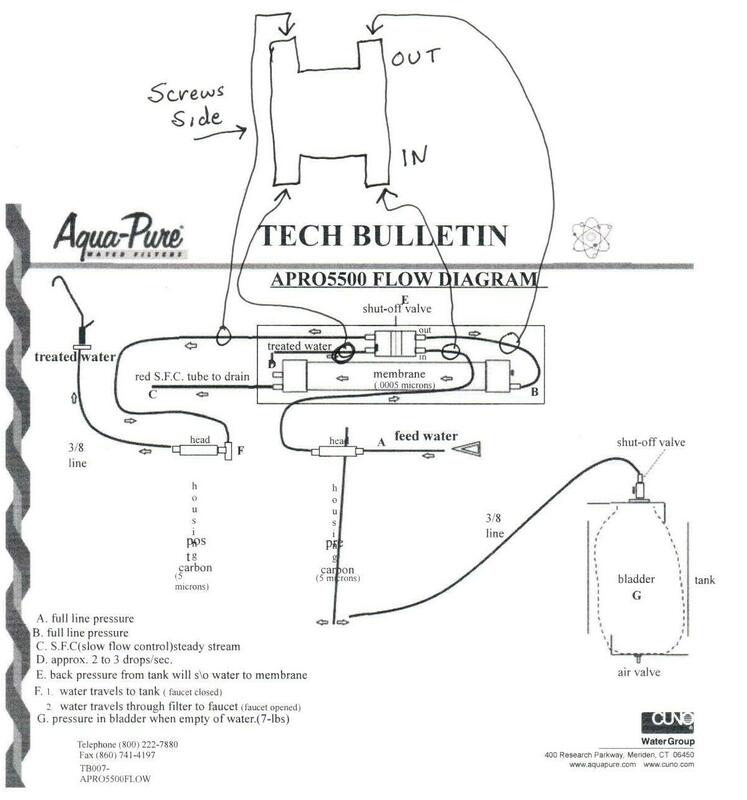 The attached photo shows the flow diagram for the APRO5500 membrane. You can also find that photo at the bottom of this post. The new shut-off valve has a different design than the original. The previous design has the in-and-out on the right side with the plumbing going horizontally. The new design will also have the in-and-out on the right side, but the flow rate goes up and down. The inlet tube is coming from the right filter and the outlet tube goes to the feed of the membrane. Replace each tube one by one or mark the tube and new valve by #1, #2, #3, #4. My new fridge filter will not fit into my fridge even though it is the same filter/model number.What could be the issue with that? Fridge filters are made by many different manufactures these days and might have a slightly different connection or might be made from a different material. As long as the model number is compatible with your fridge, it should work. Check and make sure that you purchased the correct model number before installing the filter. Sometimes you just need to put a bit more pressure onto the filter when installing it. If it seems like it is too tight to fit into the fridge, give it a bit more torque and it should pop into place. Sometimes you might need to push the filter in a bit firmer before twisting it into place. You obviously don’t want to damage your fridge or fridge filter connection, so if you have tried and tried but it still won’t go into place, feel free to contact us. How Much Air Pressure Should Be in My RO Tank? In an empty reverse osmosis tank, air pressure should be 7-10 psi. In a full/heavy tank, air pressure should be 35-45 psi. Turn off the feed water supply to the reverse osmosis. Drain the water from the tank completely thru the faucet. Close the ball valve on top of the tank. Find the valve stem located on the tank. Use an air pressure gauge to check the current air pressure. If you need to adjust the pressure, use an air compressor or bicycle pump. Fill the tank with 7-10 psi. of air. Re open the tank ball valve. If you have any other questions about your RO system please feel free to contact us. See the diagram above to connect push in style John Guest fittings. Detailed instructions below. Pull tube to ensure it is secured. If you are looking to replace a fitting visit our John Guest product page.